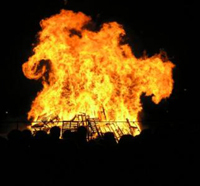 Tonight is St John’s Night, and the skies throughout Tenerife will be lit up in celebration with the annual bonfires. It is expected that tens of thousands of people will light hundreds of fires across the Canaries, mainly on the beaches. The Fire Brigade is on standby ready for its busiest night of the year to attending fires which go out of control and spread to nearby scrub land, although the cooler weather conditions today in several parts may help to reduce the problem.